Cetinje had been the capital of Montenegro for centuries until Podgorica was declared as capital in 1944, at the end of WWII. It has become the cultural and historical center of Montenegro which remained until the present day. It is also the historic capital of Montenegro, where the official residence of the President of Montenegro is located. The city is surrounded by limestone mountains, including Mount Lovćen. Because the old capital and the mausoleum of Njegoš are not far from each other, we were able to visit the two places on the same day during our Montenegro road trip. This place is also a perfect day trip destination from Budva. It is part of the Lovcen National Park tour which starts from Budva. Cetinje was founded in 1482 when Ivan Crnojević moved his capital to a more easily defended location in a field at the foot of Mount Lovćen. He had his court built at the new location that year and also founded a monastery as a personal endowment in 1484. The town was named after the Cetina river. During 16th and 1th centuries, Venice and the Ottomans frequently attacked the city. In this period the court and the monastery of the Crnojevići dynasty were destroyed. It was only at the end of the 17th century, in 1697, that Cetinje began to flourish again under the rule of the Petrović dynasty. Cetinje made great progress under the rule of Prince Nikola I Petrović. During the time numerous public facilities were built, such as the first hotel, then the new Prince’s palace, the Girls’ Institute, and the hospital. After Montenegro’s independence was recognized at the Congress of Berlin in 1878, Cetinje became the official capital of Montenegro. On the 4th day of our Montenegro road trip, we left Tivat and took the route via E65/E80 and M2.3 to reach the historic capital of Montenegro, Cetinje, a treasure of cultural and historical heritage. The city is at the foot of the Lovćen Mountain. Our first impression was numerous old but elegant buildings in this place. These were once Embassies from countries around the world, such as France. We were able to read short English description of each building’s history presented on a copper plate outside of each building. Those foreign embassies were built due to the newly established relations with various European countries. Compared to those Mansions Cetinje Monastery is rather an unimpressive building. Some simple one-floor houses and these stately mansions were line up on the same street. Cafes have seats on the streets and locals were sitting outside eating and drinking. There is no high-end business in the town. It is interesting to see the Balkan life there. We had lunch in one local restaurant. The restaurant is part of the family’s house. The eating room seems to be their living room before. And, we couldn’t tell what the ingredients were used in our food. Perhaps it used the family recipes. Whatever, it was tasty. After so many years, this remote city still looks so glamorous, charming and characteristic. 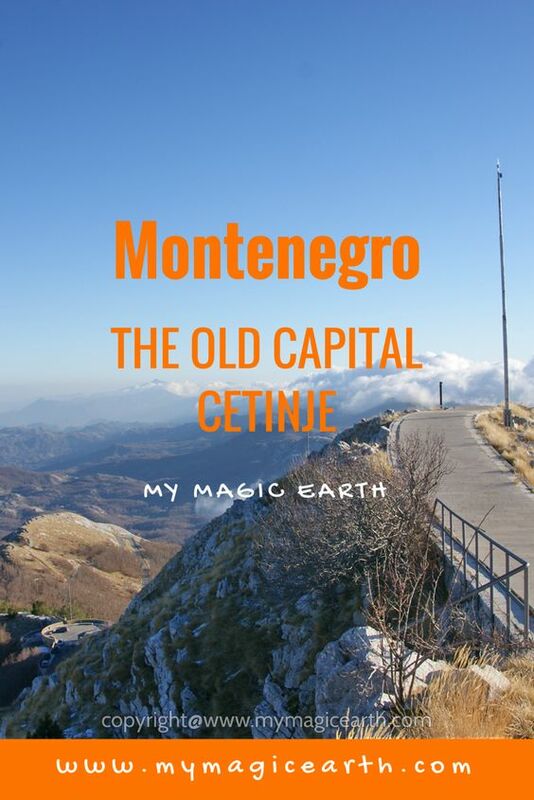 We were just wondering, when Montenegro had such a beautiful capital before, why it ever shifted to the current one? It’s the history. We continued our journey of the day to Lovćen. The mausoleum of Petar II Petrovic-Njegoš is located at the top of Lovćen national park. Having passed a long concrete road, we walked up many stone steps until reached the entrance of mausoleum. Stone stairs were inside a huge concrete tunnel and were constructed by using big stone blocks. We felt very chilly inside the tunnel. In the entrance area, we saw a 360-degree spectacular view of the rough grey mountains and had a WOW feeling of being above the clouds. It was quite windy there though. The mausoleum itself was not particular of our interest, but the nature is stunningly beautiful. Spectacular View of Lovćen national park. According to our original plan, we should take the same road via Cetinje back to Tivat. It was easy to drive, and we would be back in less than two hours. However, we discovered another route via Kotor Serpentine. The road has many hairpin turns. It requires strong nerves to drive there. There is little room for an error on this road. I would not recommend a novice driver to attempt. The stretch is very steep, but it ends at one of Montenegro’s most beautiful places, Kotor Bay. During the winter season, there was nearly no traffic. The views were spectacular, and we stopped at one place to capture the landscape. When we finally arrived at Tivat, it was already dark. These tours usually include several activities and sightseeing. You can visit the following tour operators and select a tour which suits your need. There are many apartments in Cetinje. For example, Royal Apartment, it offers accommodation with a kitchen. This 2-bedroom apartment includes 1 bathroom equipped with a shower. A flat-screen TV is featured. The apartment offers a terrace. Both a bicycle rental service and a car rental service are available at Royal Apartment. The WIFI is rated as excellent by the guests. To book the apartment, please check the following platform. Cetinje is 12 km of air-line far from Adriatic Sea (20 minutes by car) and 15 km far from Skadar Lake. It is located on the main road Podgorica-Cetinje-Budva, which makes it well connected to the inside of Montenegro and Montenegrin coast. From Budva: After a 10-minute drive south of Budva’s old town there’s a turning that heads inland to Podgorica. This turning will take you on the tour above Budva which will give you panoramic views of the Budva Riviera. The road leads straight to Cetinje. From the Bay of Kotor: You can also get there via Lovcen, which is an especially scenic route – you’ll take the stunning serpentine road above Kotor to Njegusi, head over to Lovcen then continue on to Cetinje.